This latest edition has been updated with new and revised definitions to keep it current and at the forefront of essential information for those seeking a timely legal resource. 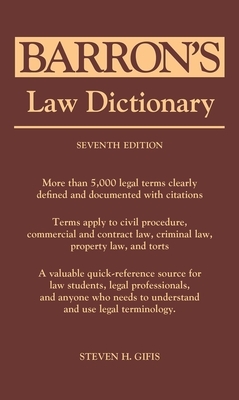 It includes recent modifications in federal and state law, making it a quick-reference guide for law students, legal professionals, and interested laypersons. The author defines more than 5,000 legal terms, using nontechnical language that remains legally accurate. Terms are documented with citations and apply to civil procedure, commercial and contract law, constitutional law, criminal law, property law, and torts. This title is also available in a larger trim-size trade edition with bigger type.